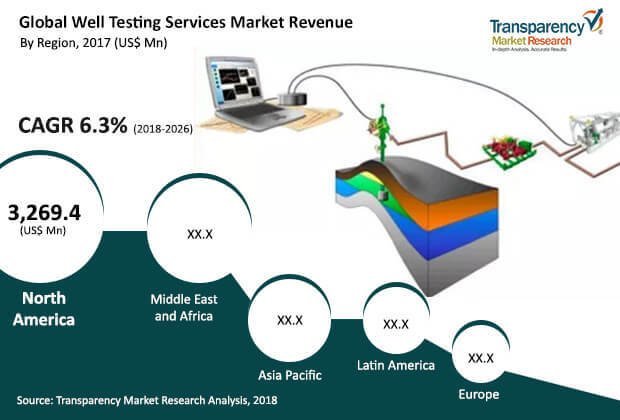 The global well testing services market was valued at approximately US$ 6 Bn in 2017 and is anticipated to expand at a CAGR of more than 6% from 2018 to 2026, according to a new report titled ‘Well Testing Services Market – Global Industry Analysis, Size, Share, Growth, Trends, and Forecast, 2018–2026’ by Transparency Market Research (TMR). Rising expenditure on offshore E&P activities is expected to propel the demand for well testing services across the globe. Among types, the subsea services segment constituted more than 25% share of the global well testing services market in 2017. Subsea services involve a complete package of equipment installation, jointing, personnel, and maintenance. Subsea services include installation services, asset management services, inspection maintenance and repair (IMR), and production optimization services, which are related to subsea oil & gas assets. Subsea landing strings are widely used for offshore well testing operations. They are employed to reduce the risk associated with the use of tools designed for ultra-deep-water, high-pressure and extreme-temperature reservoir testing. They are used in offshore well testing, completion and intervention projects. Subsea services consist of subsea landing string operating systems, subsea test tree systems, and subsea service support infrastructure. The investment in subsea landing string services is higher than other services, due to their several uses in offshore operations. Thus, the subsea services segment holds a major share, in term of value, of the global market. North America dominated the global market for well testing services in 2017, owing to presence of a large number of rig wells in the U.S. and Canada. The U.S. possessed more than 850 rigs and Canada owned more than 200 rigs in 2017. The U.S. EPA promulgated the ‘Oil & Gas Extraction Effluent Guidelines & Standards (40 CFR Part 435)’ in 1979. It amended these regulations in 1993, 1996, 2001, and 2017. The regulations cover wastewater discharge from field exploration, drilling, production, well treatment, and well completion activities. These activities take place on land, coastal areas, and off the shore. The EPA established pre-treatment standards under Sub-part C in 2017. These standards prohibit discharge of wastewater pollutants from onshore unconventional oil & gas (UOG) extraction facilities to publicly owned treatment works. The EPA has not promulgated effluent limitations guidelines and standards for pollutant discharge from coal bed methane extraction facilities. Declining prices of crude oil can have an adverse effect on well testing services across the globe. Governments of several countries have imposed strict norms on carbon emissions, which has shifted investments to the renewable energy sector. Governments are providing subsidies for generation of renewable power, which has made well testing a highly lucrative market. Among applications, the offshore segment dominates the well testing services market. Excess depletion of onshore oil & gas assets has shifted investments from onshore to offshore oil & gas assets. Rising demand for energy and increasing expenditure on shallow-water, deep-water, and ultra-deep-water oil & gas assets are expected to propel the demand for well testing services in the near future. Several key players in the oil & gas industry are investing heavily in offshore assets. Thus, a move from onshore to deep-water offshore drilling is expected in the next few years, led by major international oil and E&P companies that are willing to invest in exploration efforts. More than 70% of new discoveries pertain to offshore areas. North America dominated the global well testing services market in 2017 and the same trend is expected to continue during the forecast period. The U.S. drilled more than 14,000 wells in 2016 and is expected to explore more oil & gas wells in the near future. The U.S. upstream sector is a complex combination of technical, financial, political, and logistic factors. Growing exploration of unconventional reserves is likely to boost the demand for well testing services in the country in the near future. The global well testing services market is highly competitive. The market is highly fragmented with the presence of a large number of local and international players in the market. Leading players dominate the market. Key players operating in the global well testing services market are Schlumberger Limited, HELIX ESG, Halliburton, Expro Group, Weatherford International Plc., SGS S.A., Tetra Technologies, Inc., TestAlta, CETCO Energy Services, Oil States International, Inc., PTS Production Technology & Services Inc., Abraj Energy Services SAOC, Emerson Automation Solutions, Integra Group, and TechnipFMC plc.